Whenever Michael Kluckner reads “opportunities for builders” on real estate listings, he knows it’s time to pack his watercolour set and document another Vancouver house that is about to vanish. 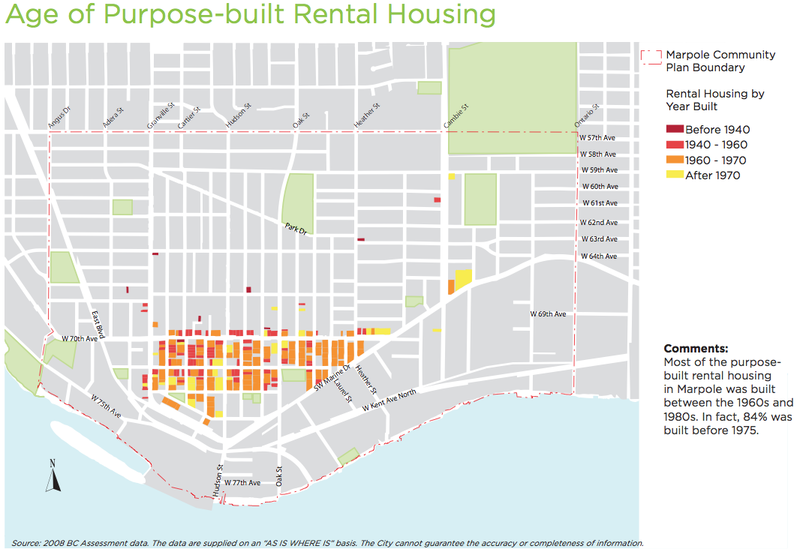 Rezoning is big business in Vancouver in and March, the city is particularly abuzz with information sessions and public hearings about architectural changes such as high rises, laneway houses and townhouse complexes. “Laneway housing isn’t a bad idea, but you cannot call it affordable,” said author and artist Michael Kluckner, who wrote several books about Vancouver’s vanishing architecture, and the lifestyle that came with it. “There’s nothing sustainable about densifying neighbourhoods and taking away green space,” said Kluckner. Kluckner will conduct a presentation on Saturday, March 9 in St. Augustine’s Parish Hall in Marpole. The presentation will deal with lost Vancouver architecture and lifestyle and a projection of the future of the city. Kluckner will focus on Marpole and South Vancouver. The PowerPoint-demonstration is a fundraiser for the Marpole Historical Society. 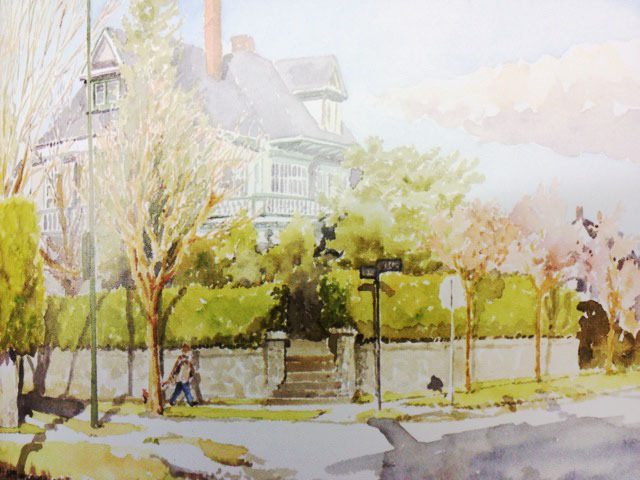 Kluckner has been painting watercolour paintings of Vancouver houses that were about to be demolished for decades. Many of his paintings are published in his books. Klucker is not a stick-in-the-mud, but said he is concerned about the over-densification of neighbourhoods, which can ironically lead to isolation of individuals and a loss of community spirit, in his opinion. Marpole experienced its largest housing boom between 1945 and 1980, when 71 per cent of Marpole’s dwellings were constructed. In contrast, only 2 per cent of Marpole’s dwellings were constructed between 2001 and 2006. Compared to the City of Vancouver, the percentage of dwellings built in Marpole before 1990 is higher than the city overall (81 per cent vs. 73 per cent). At the time of the most recent census in 2011, Marpole had a population of 23,832 (4 per cent of the city population overall). From 1971 to 2011, Marpole’s population increased a total of 35 per cent (compared to 36 per cent city-wide). Marpole’s most rapid population growth occurred between 1986 and 1996, when it experienced a 12 per cent increase. During this same time period, Vancouver’s population grew by only 7 per cent. Marpole experienced almost zero growth between 2006 and 2011. Marpole’s community plan forecasts a population growth for the area from 24,780 today to an estimated 31,670 in 2041. This is a 27 per cent increase, which would still leave ample space to grow, according to city planners. The calculated capacity for the area is around 40,000 inhabitants. A public hearing at City Hall on March 14, 6 p.m. will deal with new residential developments, mainly highrises along Cambie Street between Oakridge and Marpole. This entry was posted in Arts & Culture, Marpole, Real Estate and tagged EcoDensity, Katja De Bock, Marpole community plan, Marpole Historical Society, Michael Kluckner, Real estate Vancouver, Rezoning, Vancouver development, Vancouver's first children's hospital by westsidebeat. Bookmark the permalink.